Today we are heading out on our big vacation. Tomorrow we fly to Disneyland. The next day we will be in 100% vacation mode. Can't wait. Today I got an e-mail from a woman in Germany telling me how much she loves my blog playlist, which is so exciting to me. Hi Sandra! She also recommended the artist Bic Runga, and I love her voice. Check her music out. Tomorrow, a new album which I have been anxiously anticipating will hit the shelves. 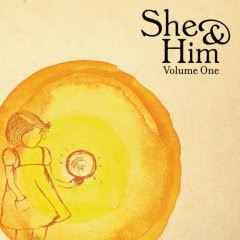 It is called Volume One by She & Him, which is a new group formed by Zooey Deschanel (yes, the actress) and M. Ward. This album appears to be very unique and interesting. It sounds a little bit folksy, a little bit Dusty Springfield, a little bit country, and a whole lot of cool. And Deschanel's voice is perfection. I will be finding a music store in California to add this album to my music collection. The next day, Lily will be in her Cinderella dress hoping for a photo op with THE princess herself. We are hoping a Disney dream will come true. I will be back to blogging on Monday, March 31st with all of the vacation details, but in the meantime...be sure that today, tomorrow and the next day, I will be wishing you a lovely day!